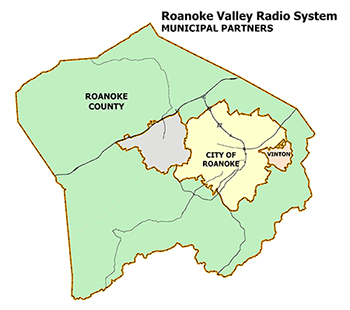 The Roanoke Valley Radio System was formed in 1998 with an intergovernmental agreement between Roanoke County and the City of Roanoke. The system was planned and designed to service Police, Fire and Rescue, and the Sheriff’s offices of both municipalities. The original system consisted of a 23 channel Motorola Analog SmartNet Trunked Simulcast system operating from four mountaintop locations that encircle both localities. 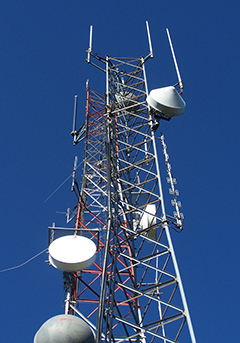 In 2009 the Roanoke Valley Radio System converted 15 channels to Astro Digital P25 System. In 2011 five new frequencies were added to the system and seven more were converted to the digital platform. The current system has 22 Astro Digital channels and six Analog Smartnet channels. A new intergovernmental agreement was drafted and ratified by the Roanoke City Council and the Roanoke County Board of Supervisors in 2012 to encompass governance, maintenance, cost sharing, and dispute resolution for the system. Through mutual aid agreements with neighboring localities, Roanoke County staff also provides communication support across community borders into Montgomery, Franklin, and Botetourt counties. The system is maintained by staff from both the City of Roanoke and Roanoke County Radio communications staff. Both local governments have committed to maintaining staff proficiency through a combination of formal training by Motorola, distance learning, and on-site education programs. To learn more about the features of the system, download the Roanoke Valley Radio System presentation (PDF).